BEIJING IS HEADQUARTERS in China for Cyber Import. 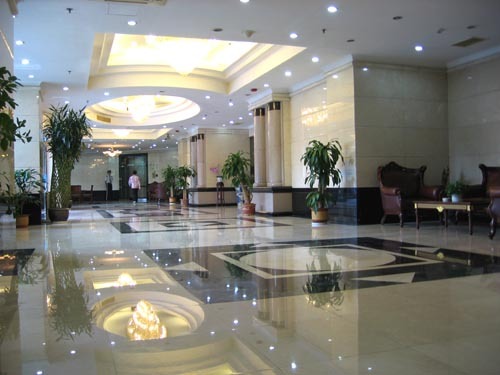 We are easy to find in the Bauhinia Court Building of the Golden Cross area. While its western facade faces an intimidating twelve lanes of automotive mayhem and stress, our sunrise side conceals a classic lake and park. 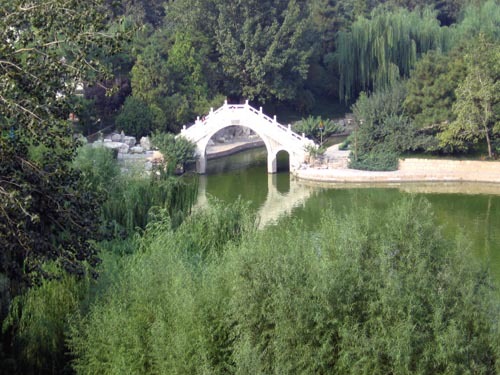 True, Tuan Jie Lake Park doesn't compare to the Emperor's Summer Palace and is on no tourist short list. However, it undeniably makes a great backdrop as we develop your business needs. WHEN YOU CONTACT US and note a happy sense of serenity, well, the lake's ambience explains it. The computer age can save you a lot of overhead rather than travel here. However, for those of you lucky enough to mix both holiday with business, we are delighted to share our little Beijing niche whenever you drop in to say hello. 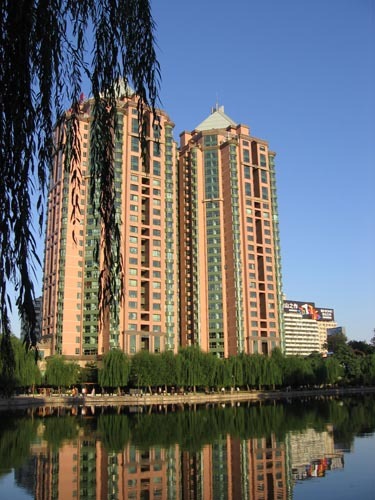 The Bauhinia Court Building towers are on the left, or east side of the highway. 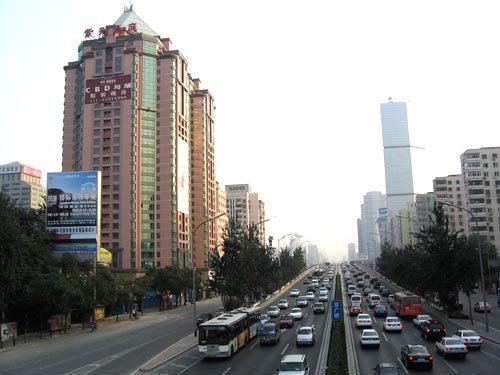 Known as the Third Ring Road, it is twelve traffic lanes wide with side streets. Fourteen, counting equally congested bicycle lanes. On the right is the tall, five star, Jing Guang New World Hotel. Further up on west side is the World Trade Center. Your taxi can turn into our building. Once cleared by security, it can proceed around back to the main entrance on lake side. There, a doorman can give you a hand. Bauhinia Court is the Ying and Yang of urban contrast. City gridlock and thunder of commerce on one side, a Zen-like mood and opportunity to relax in the park on the other. 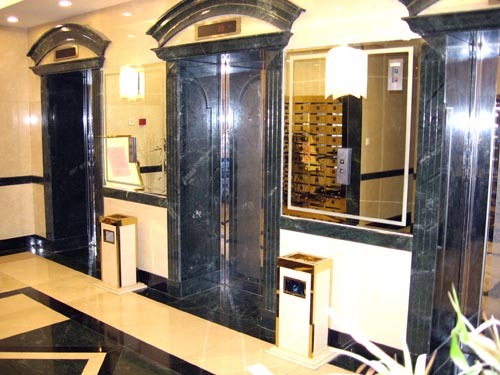 When you enter our lobby, just turn to the right and head over to the elevators in Tower One. The doors into it probably are open and not locked. But if they are, there is a video monitor to the left of the door from which you can ring our office at 8C. The front desk is also manned 24 hours a day and can point you in the right direction or receive a delivery. This image is more for the amusement of the many visitors we have had over the last several years. They no doubt recall with less fondness our former building that had way fewer frills. Please note that the middle elevator only stops at odd-number floors, while both left and right elevators stop on our Floor 8. Detailed directions, but we give the same kind to factories about your products. 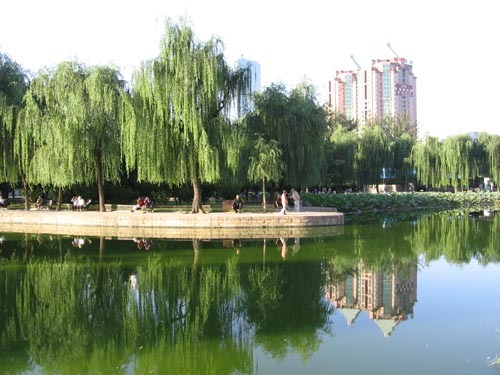 Just below our windows, Tuan Jie Hu Park reveals idyllic dreamers on benches. Whispers of lovers are lost among the ripples of water stirred by a breeze on the lake. Other couples wander among stone paths through a wide variety of old trees and flowers. 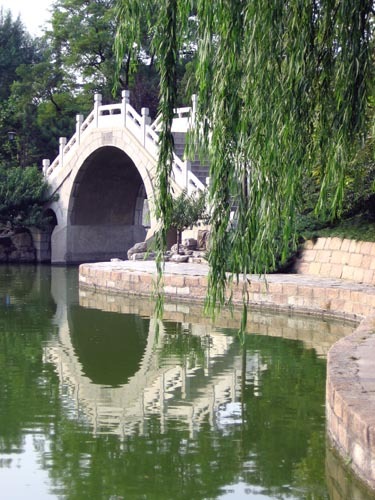 Peddle boats silently explore the lake and glide under arched, foot bridges. While some elderly sit and gaze into history, others in a nearby group engage in the poetic unison of Tai Chi. Many of the vases and painting on some of the products we export have a classic, arched bridge like this one. It is a lovely little foot bridge constructed from white marble in our "back yard." 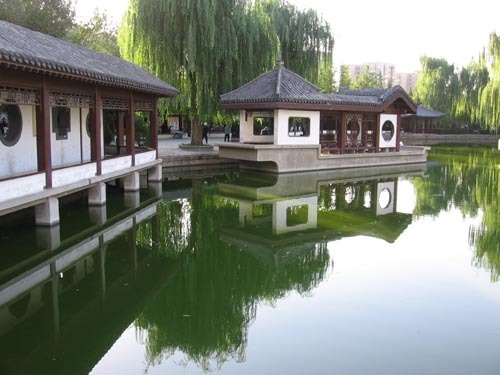 Beijingers often gather in these sheltered walkways for impromptu classic opera, play traditional music, or to exercise. This view is from a shelter walkway pictured above. It looks across the lake and park to our building in background.